It is, quite possibly, my favourite vegetable dish. Ever. So colour me flabbergasted when I discovered the vegetable on Ocado, in their “What’s New” section. Ocado is an online supermarket that specialises in quality, exotic and artisanal products. And this one comes courtesy of the guys at Curious Fruit and Veg. That discovery prompted this update, seeing how it was one of the very first posts I ever did on this blog! Almost 8 years ago! Kankung belacan always reminds me of an old, ferrari-driving friend of mine, whom I used to go dancing with in my 20s, in Singapore. Whenever he was giving me a lift home, we’d always stop off at this Chinese food stall. We’d order some rice or noodles, a chicken or beef dish, some sort of spicy sambal and always, always this kangkung belacan. lu ingat gua kambing, ka? “Do you think I’m a goat,” in English. 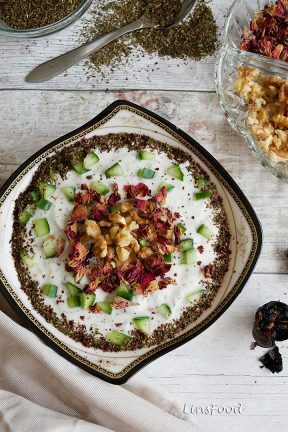 Isn’t it wonderful how certain foods always come attached with memories? What is Kangkung or Water Spinach? I’ll do a blog post on it soon, for our Culinary Garden page, let’s just talk about the recipe today. It wants the briefest of cooking times for one thing. Because the stalks are harder, we often split the stalks and the leaves, giving the former an additional minute of cooking time. In fact, much like when I cook spinach, I tend to add the leaves after I’ve turned the heat off, allowing them to just heat up and cook ever so slightly. 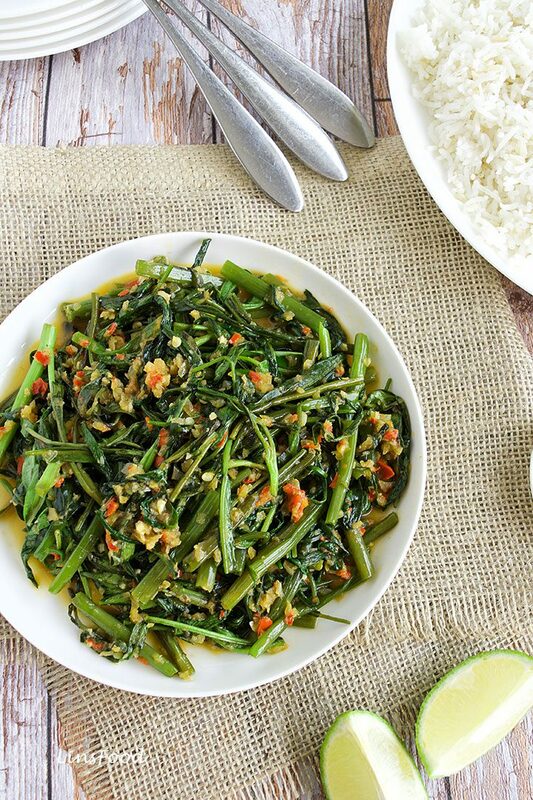 Like spinach, kangkung cooks quickly and is best eaten with a slight crunch, as is true for most vegetables! 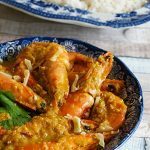 This is one of those recipes that most of the ethnic groups in Singapore and Malaysia lay claim to. You’ll find it sold by the Chinese, the Malays, the Nyonyas and the Eurasians. Head on over to the Singapore and Malaysia page to read up on the various ethnic groups in these countries. This is also, more often than not, a spicy recipe. You can always control the heat level by using more or less chillies, and also by the type of chillies. Jalapeños are going to be mild, while a bird’s eye type chilli will be spicy. Like chillies? Check out The Chilli Page! Cooking kangkung belacan is a speedy process, with the actual cooking taking no more than 3-4 minutes. Let’s take a look at a couple of “pesky” ingredients as I like to call them. Click here to read more and for substitutes. 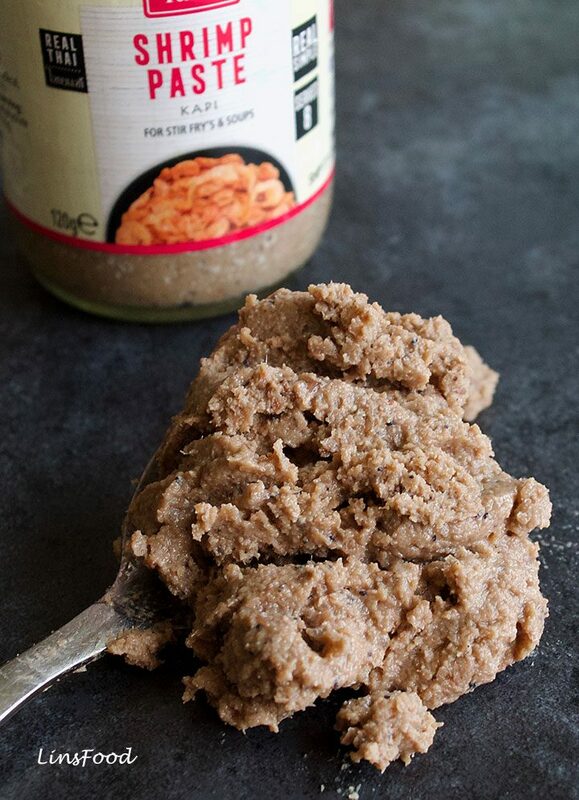 This smelly paste screams umami, and is an indispensable ingredient in South East Asian cooking. 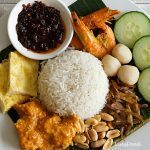 If you plan to do any Singaporean, Malaysian, Thai, Indonesian or Vietnamese cooking, then I suggest you source out some shrimp paste. Try Amazon, if there isn’t a store nearby. Here in the UK, most of our large supermarkets sell it. If you can’t get shrimp paste, you could use a couple of anchovies in oil or brine, patted dry, mashed up and used in its place. Naturally, it won’t be the same flavour, but it will be delicious! Click here to read more and for substitutes. Sun dried shrimp, these smell and taste of the sea and are brimming with umami. Again, Amazon stocks it, as does countless online shops here in the UK. I get mine from the local Chinese. Traditionally, dried shrimp in recipes like this one, will be soaked in hot water before being used. But I’ve recently done away with this soaking part, and am quite happy with the results. Bonus: it cuts down on the total time too. Chinese greens like choi sum and pak choi make good substitutes. A great non green vegetable to use in this recipe is the humble beansprout. Stir fried beansprouts using this exact recipe and amounts are absolutely delicious. You would have noticed that this isn’t vegetarian, because of the shrimp and shrimp paste. I remember having a conversation with a Singaporean uncle of mine not too long ago. He said that Malay food is very non vegetarian friendly. And he was right, for the simple reason that dried shrimp and shrimp paste are routinely used in most vegetable dishes, as a flavour base. So how do we make this vegetarian? We need to lose the shrimp base and replace it with something. To me, shiitake is one of the best vegetarian umami ingredient there is out there. And it’s my go-to ingredient when converting recipes for vegan clients and students. Dried are better, as the flavour and aroma is more concentrated. You could soak them before using, as is the norm. However, if you have a good chopper or spice mill, place them dry and grind to a powder before using. For this recipe, a handful of dried shiitake will do. 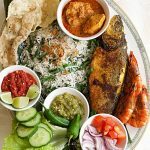 How to Serve Kangkung Belacan? 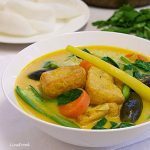 It’s a side dish, so would be perfect with rice or noodles, and perfect as part of any Oriental or South East Asian meal. Take a look at the gallery below. Then let’s get our aprons on! 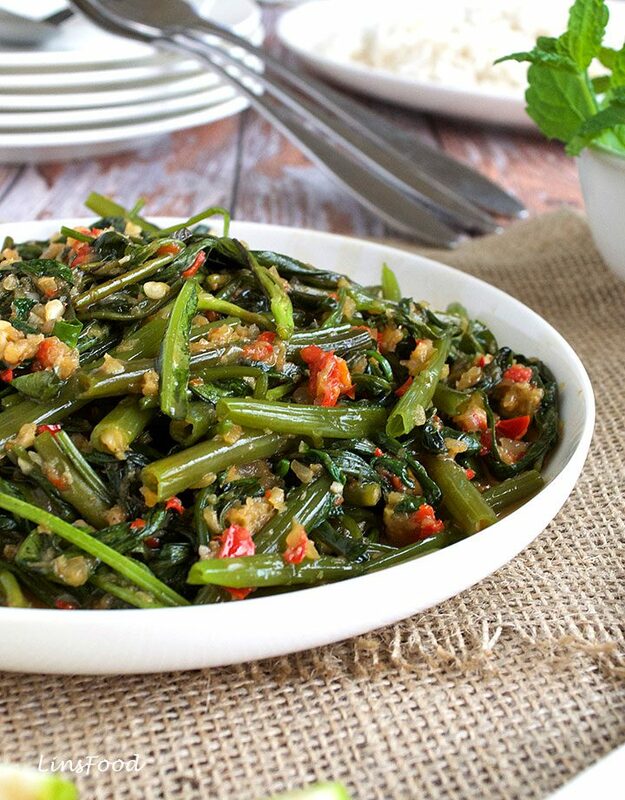 Kangkung Belacan is a very traditional and popular vegetable stir fry found in Singapore, Malaysia, Thailand and the surrounding countries. 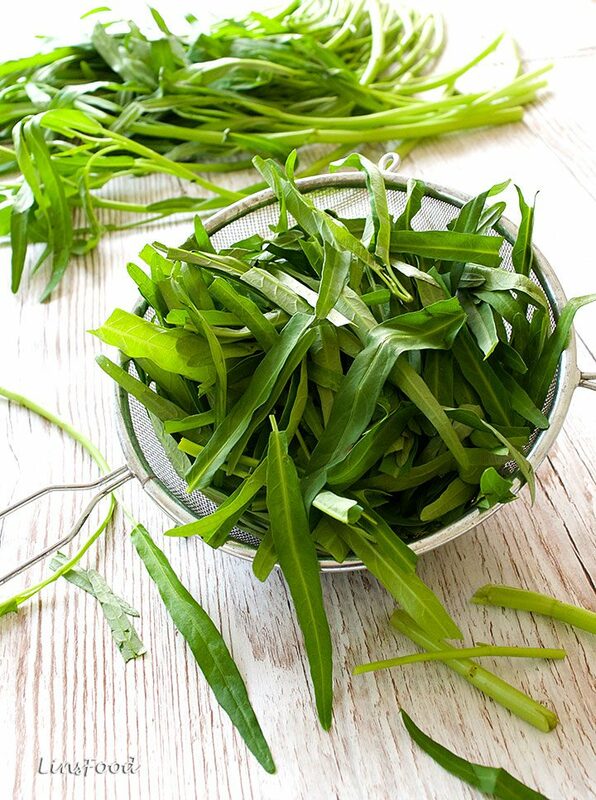 Cut the kangkung into 7.5cm/3" lengths, separating the harder stalks from the leaves, place on 2 separate plates. 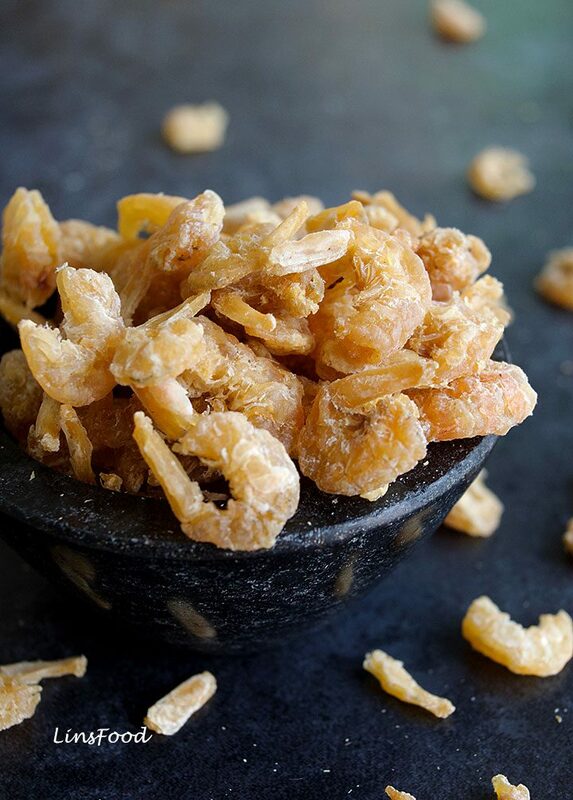 Place the dried shrimp in the chopper and chop to a floss. This should only take about 20 seconds. 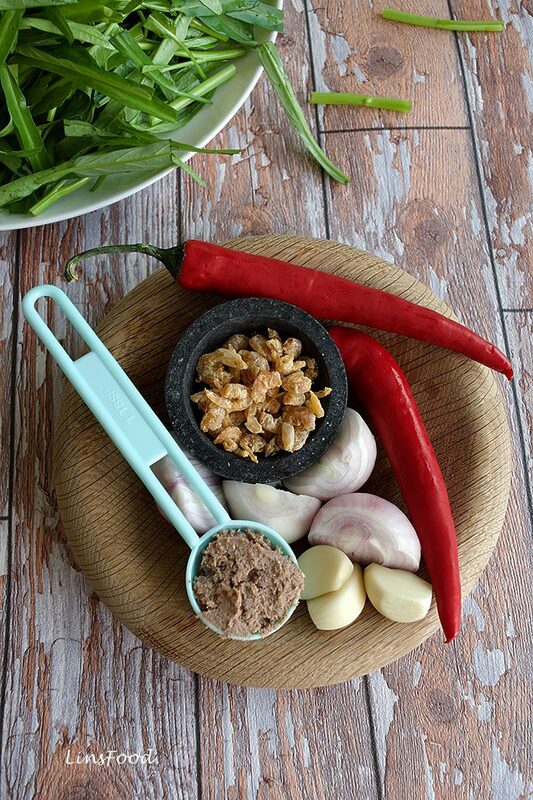 Add the onion, garlic, chillies and shrimp paste and chop to a semi fine mix. You shouldn't need to add any water. Heat the oil in a wok or frying pan on medium-high heat and fry the ground ingredients until fragrant, about a minute. Add the stalks and salt fry for a minute, mixing everything well. Add the water and stir through for 10 seconds. Turn the heat off, then add the leaves. Give it all a good stir to wilt the leaves. Check the seasoning and add more salt if you think it needs it. 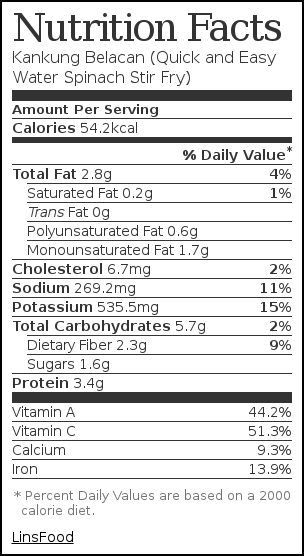 Nutritional information is based on 6 servings. The recipe sounds magical, Lin! How a very simple green is turned into a very delicious dish in 4 minutes! I think I know it as kalmi saag here but it was way back in childhood that I had eaten it last. I don’t see it around anymore. But I would love to make this simple saute with baby spinach from my garden sometime soon. This looks like something I would really enjoy. But I’m a vegetarian, so I appreciate the veggie option, thanks Azlin. Thanks Sandra, I’m glad to hear that. Where possible, I do try and accommodate vegetarians. I’ve never had this dish from your area, but am sure I had something similar at Chinese restaurants. The dried & paste shrimps coupled with garlic and a bit of kick, I’ve just mind had breakfast virtually over rice before the actual one! P.S. The Japanese food is usually very non vegetarian friendly, as well. Thanks Kenta. I never really thought about Japanese food, but when one stops and thinks about it, yeah, you’re right! You are always introducing me to new ingredients, Azlin. I think I have seen this at the Asian shops near me (in BC). Have bookmarked, really curious to try this. Glad to be of service! Let me know how you get on! Oh man, Ocado sells kangkung? I really need to switch over to them. My Chinese is so unreliable with their fresh produce, I can never get it. Thanks Lin! They sure do. Yes, that’s exactly the same for me, so I’m really pleased with this.